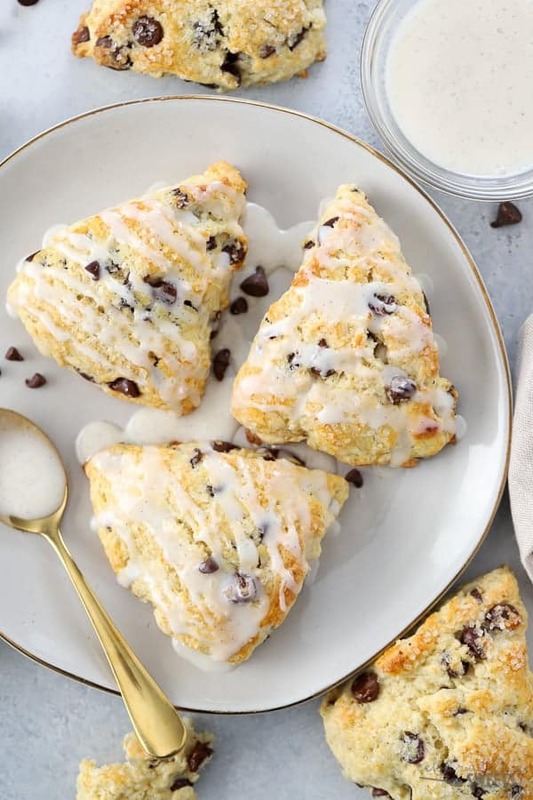 The perfect Chocolate Chip Scones – Tender and buttery, studded with chocolate chips and topped with a vanilla glaze. These heavenly scones are coming to lure you out of bed. If the idea of dipping a buttery, chocolate-studded scone into your morning coffee doesn’t have you leaping from bed, than I don’t know what will. 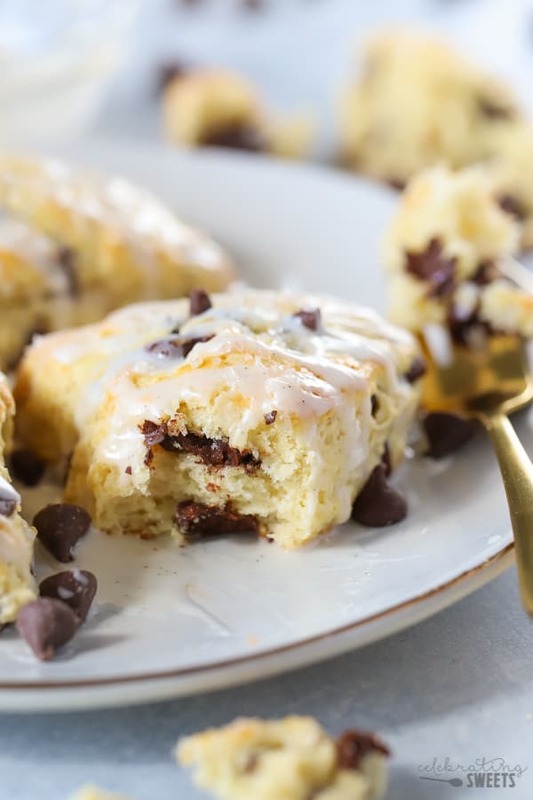 Whether it’s French Toast Casserole, our favorite Banana Bread, or these tender Chocolate Chip Scones, my family is always happy to start our day with something sweet and comforting. If you *think* you don’t like scones I will tell you that you are wrong. 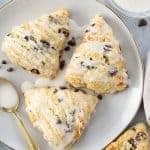 There are so many dry, flavorless scones out in the world that are tricking people into thinking that scones are “blah.” But the truth is, if you have a good scone, like a really good scone, you will see how incredibly delicious they can be. Scones should be flaky and buttery, with a soft and tender interior, and a slightly crunchy exterior. Scones can be filled with a variety of flavors: chocolate, vanilla, berries, apples, citrus, spices, nuts, and more. The flavorings will enhance the basic scone and take it from good to great. 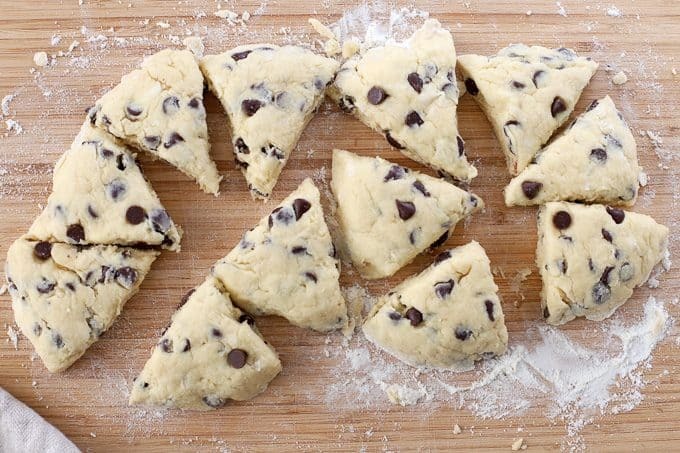 Today we’re making Chocolate Chip Scones! This recipe is easier than you may think. You don’t even need any special equipment. Start by mixing the dry ingredients in a large bowl. 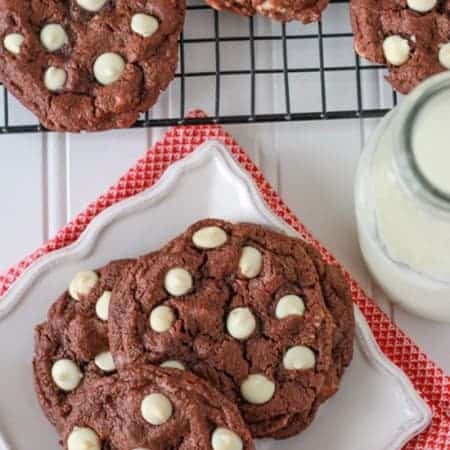 Add cubed cold butter and work it into the flour with your fingers (simply rub it in the flour until you have pebble-sized pieces of butter throughout). 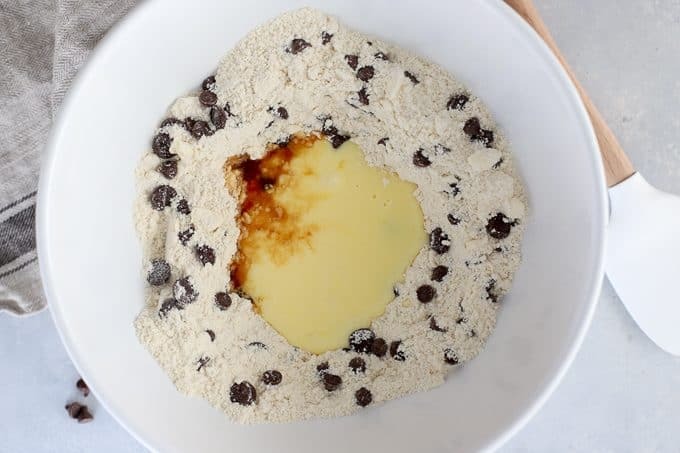 Add the chocolate chips, then stir in buttermilk, egg and vanilla. Dump the dough onto a lightly floured surface and pat into a 1-inch thick circle or rectangle. Cut into desired shapes and bake. Sugar topping: I like to sprinkle the top of the scones with coarse or sparkling sugar right before baking. This adds a crunch to the scones and makes them absolutely delicious. If you’re planning to add a glaze (more on that below), then you can skip the sugar topping or add both. Glaze topping: I love the flavor of vanilla and chocolate together, so this vanilla glaze is the perfect topping for our scones. Simply whisk powdered sugar, milk and vanilla extract. You can make the glaze as thick or thin as you’d like by adjusting the wet and dry ingredients. You can drizzle the glaze over the scones or you can double the glaze recipe and cover/pour the glaze over the scones. Reheating scones: Homemade scones are definitely best the day they are made, and they are their absolute best served warm, straight from the oven. If you are planning on storing the leftovers, I recommend that you skip glazing the scones that will be stored. Package them tightly covered and reheat them on a baking sheet in the oven or toaster oven. Glaze at that point, if you wish. 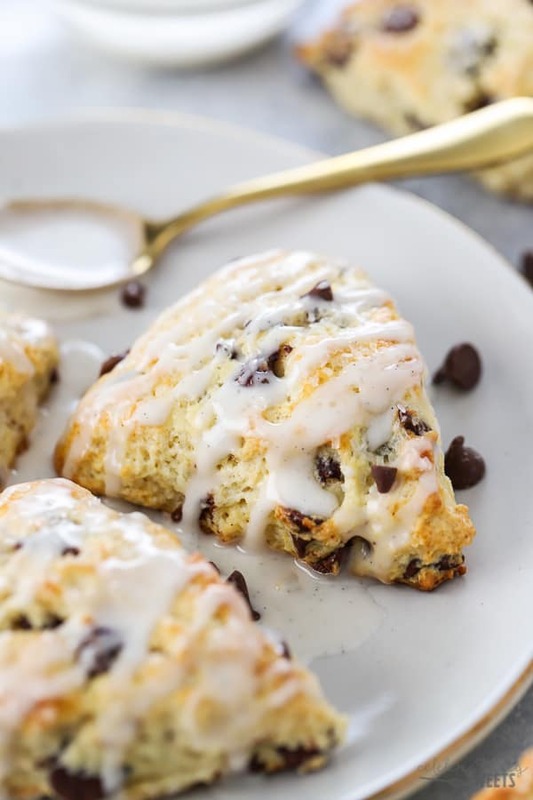 The perfect Chocolate Chip Scones - Tender and buttery, studded with chocolate chips and topped with a vanilla glaze. Preheat oven to 425°F, with a rack in the upper-middle position. Line a baking sheet with parchment paper. In a small bowl whisk buttermilk and egg. Set aside. In a large bowl, combine flour, sugar, baking powder and salt. Scatter butter pieces over the flour. Using your fingertips (or a pastry cutter), work the butter into the flour by rubbing it quickly into small pieces. 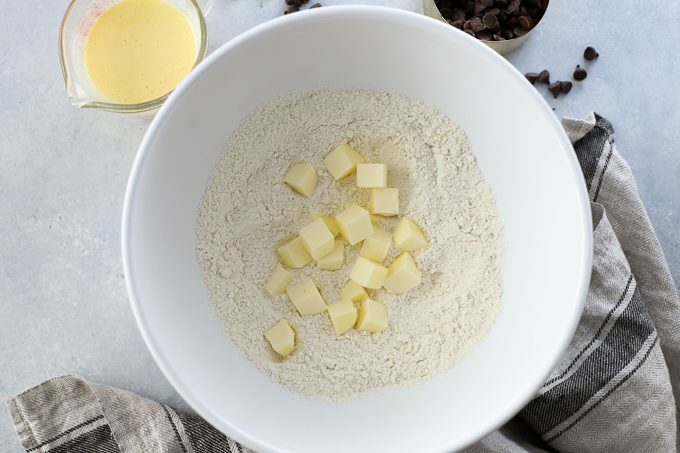 Proceed until the mixture resembles a sandy texture with pebble-sized pieces of butter (the pieces of butter will be irregularly shaped; that's fine). Stir in the chocolate chips. 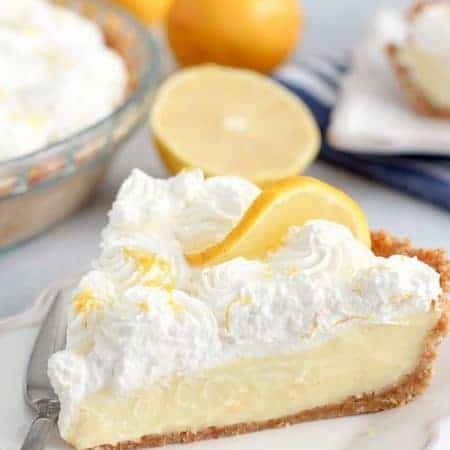 Reserve 1 tablespoon of the buttermilk-egg mixture (this will be for brushing the top of the scones), pour the remaining buttermilk mixture into the flour, along with the vanilla extract. Use a rubber spatula or wooden spoon to stir the dough until it starts to come together. Once it’s almost all the way combined, dump the dough onto a floured work surface and knead it a couple of times until it comes together. Pat the dough into a ¾ inch thick circle or rectangle. Cut into desired shapes (I made 12 triangles). Place the scones on the baking sheet. Brush the tops with the reserved buttermilk, sprinkle with coarse sugar. Bake for 11-14 minutes, until the bottoms are beginning to brown and the tops are light golden brown. Place the baking sheet on a wire rack to cool. Whisk ingredients in a small bowl until combined. Adjust the consistency by adding a little more powdered sugar (to thicken) or cream (to thin). Drizzle over the slightly cooled scones. Has anyone asked about savory scones? Looks mouth watering! This is my kind of breakfast and I’m really so excited to make this! Amazing scones! 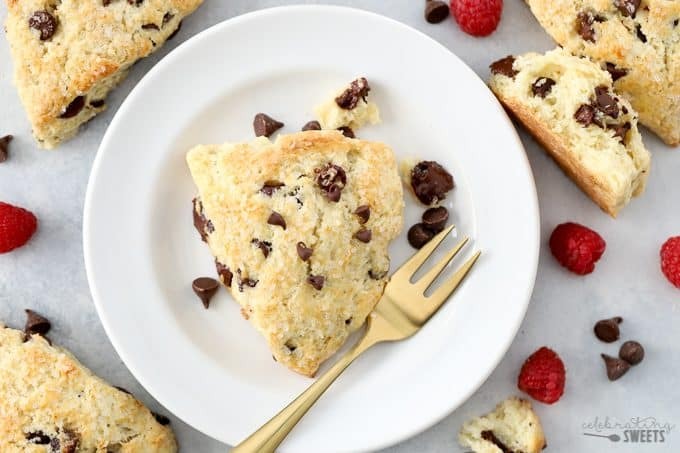 Love the scone texture combined with chocolate chips. WOW!!! OMG these look so good and great for a quick breakfast! Pinning! Thanks for sharing! How scrummy do these look? These will be my sweet treat over the weekend! These scones look so delicious! Love how packed with chocolate chips they are! These are perfect for breakfast or with my afternoon cup of tea. 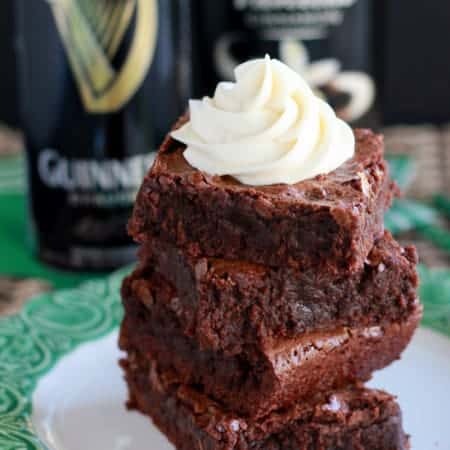 I can’t wait to make them this weekend. I’d happily eat this for breakfast any day of the week! !